We went to watch "Tick, Tack & Tock : The Farmer & the Cookie" at the Eslanade Recital Hall on 20th Dec, Sun with our friends. It's the first time we went to watch a mini-musical with Baby G. We decided to start 'small'; a simple 45min show so that Baby G doesn't get too overwhelmed. As expected, he didn't really like the show, although Zac gor gor enjoyed himself very much. But glad to say, he didn't cry nor freak out and just watched (or rather, stared at) the show. At the end of the show, I asked him if he liked it and he told me "no". Quite disappointed with his response. Then I asked him if he wanted to take a photo with the cast, I expected a "no" again but he surprised me by agreeing to pose with them. He was even ok to go on his own to take the photo. After the show, we went to look for Daddy at the Library@Esplanade. We took a walk outside and saw the huge white balloons along the bay. 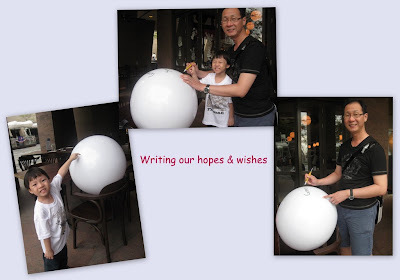 They were also handing out the balloons for us to write our hopes & dreams. Since Baby G not yet up to par with his writing, and yet, we didn't want to leave him out. We asked him to draw an apple. That's the only thing he knows how to draw. haha. He also drew a snake which basically was simply a long, never-ending single line. what is all these "ball pollution" for? Same like the ducky thingy? Similar concept, but doesn't have the gambling aspect to see which one 'wins'. I suspect there's neeting underneath it to capture the balls that deflate eventually.